7 Simple tips to cover bruising with make up. 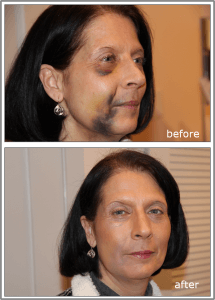 One of the gals at the jane Iredale office had a procedure done that caused significant bruising. With a little help from Enlighten Concealer, Amazing Base and Corrective Colors, she was able to camouflage most of it! Below are the steps Jane Iredale Product Training Coordinator, Christine, used to achieve these results. When covering severe bruising, the goal should be to make the appearance better, not perfect. If you keep camouflaging until it is perfect your makeup may start looking caked on. Hold your mirror at a social distance or arms length away when evaluating your coverage. This is the same distance others will be seeing you from. Often times we make the mistake of applying our makeup only a couple of inches away from the mirror, very few people ever get that close and this can sometimes cause us to apply too much or too little. If you are concerned about whether you should be applying makeup to your bruising, check with your doctor first. 1. Apply Enlighten Concealer to the darkest areas using the Foundation brush in a stippling motion and feather the edges. Use the Camouflage brush for smaller areas. 2. Apply Yellow from Corrective Colors to any red areas using the Camouflage brush in a stippling motion and feather the edges. 3. Apply Amazing Base with the Flocked Sponge by gently pressing and rolling over the concealed areas; we used Warm Sienna. Then use the Chisel Powder brush to apply Amazing Base to the rest of your face. 4. Apply more Enlighten concealer to any black or blue areas still coming through (same as step 1). 5. Use the Chisel Powder brush to apply more Amazing Base over the concealed areas. Spritz with Hydration Spray to set. 6. Apply Copper Wind PurePressed Blush over any ashiness using the White Fan brush. 7. For this look, finish with Sunbeam Bronzer on your cheeks and Fascination Lip Fixation on your lips. This blog post is the courtesy of Jane Iredale Make Up. Photo Courtesy: Jane Iredale Make up.